Pulled pork is now so popular that I sometimes wonder where we'll be looking next for our meaty cravings. Well I know where it will be - it'll be oxtail. Some people I know still get squeamish about oxtail, but there's absolutely no need to be. For a start, it's not like you're bringing home a hairy, swinging tail from the butcher's - it's all tidied up and cut up into knobbly coins for you. And yes, there's quite a bit of cartilage and bone in there, but you'll be surprised at how much meat flakes off it after an afternoon in the oven. And anyway, all that cartilage - in the form of collagen - is supposed to help you stay looking younger. Honestly. Now. Don't be put off if you are a Marmite hater - you can't really taste a strong Marmite flavour in the recipe, but it does lend a sticky, dark sweetness after it's been simmering away with the meat for six hours. My children love this - and it's cheap, too. First, roast the oxtail pieces. 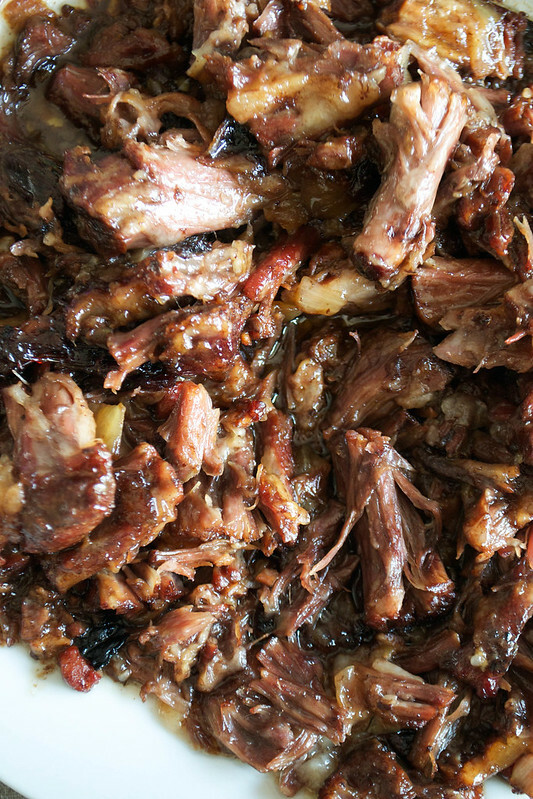 Heat the oven up to gas mark 7/220ºC and tumble the oxtail pieces onto a shallow roasting tray. Sprinkle with a little salt and roast for 15 minutes, until they've just started to turn slightly golden from the heat. Meanwhile, heat the bacon lardons in a frying pan and fry, until the marbled fat begins to melt. Throw in the onions and fry gently until softened. Once the onions are soft and the bacon is golden, drain off any excess fat in the pan and then pour in the beef stock. Bring it to a simmer, stirring in the Marmite too, and put to one side. Take the oxtail pieces out of the oven and, using tongs, transfer them to a casserole dish with a lid. Pour the bacon and stock mixture over the top, replace the lid and slide into the oven, turning it down to gas mark 3/160ºC as you close the oven door. Leave to cook gently for 6 hours. Once the 6 hours are up, remove the lid. You should have soft, tender meat that falls easily from the bone and a reduced, if slightly oily, dark gravy. Lift the oxtail pieces out onto a chopping board or plate and scrape off the meat and fat from the joints, getting rid of the bones. Using a ladle, remove most of the oily top layer from the gravy and discard. Add the shredded beef back in to the sauce, if needed, and serve. How do you like oxtail? What's your favourite oxtail recipe?